I was listening to a science show the other day and came across this weirdness. The scientist said most people have witnessed this. Not sure where he was coming from, but I have never seen one, or even heard about them. A light pillar is an atmospheric optical phenomenon in the form of a vertical band of light which appears to extend above and/or below a light source. The effect is created by the reflection of light from numerous tiny ice crystal suspended in the atmosphere or clouds. The light can come from the Sun (usually when it is near or even below the horizon) in which case the phenomenon is called a sun pillar or solar pillar. It can also come from the Moon or from terrestrial sources such as streetlights. Since they are caused by the interaction of light with ice crystals, light pillars belong to the family of halos. The crystals responsible for light pillars usually consist of flat, hexagonal plates, which tend to orient themselves more or less horizontally as they fall through the air. Their collective surfaces act as a giant mirror, which reflects the light source upwards and/or downwards into a virtual image. As the crystals are disturbed by turbulence, the angle of their surfaces deviates some degrees from the horizontal orientation, causing the reflection (i.e. 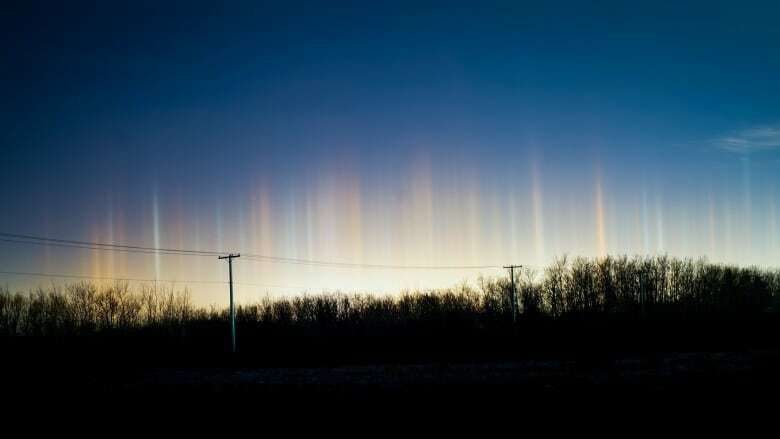 the light pillar) to become elongated into a column. The larger the crystals, the more pronounced this effect becomes. More rarely, column-shaped crystals can cause light pillars as well. In very cold weather, the ice crystals can be suspended near the ground, in which case they are referred to as diamond dust. Unlike a light beam, a light pillar is not physically located above or below the light source. Its appearance of a vertical column is an optical illusion, resulting from the collective reflection off the ice crystals, only those of which that appear to lie in a vertical line direct the light rays towards the observer (similar to the reflection of a light source in a body of water). This video is quite compelling. If this is a hoax, it is a very elaborate one. It would be extremely difficult to pull off. Putting a young child in an ape suit just doesn’t make sense. Very interesting. Did the Space Aliens Land in NYC? (CNN) An electrical flash at a Con Edison substation in Queens temporarily lit up New York’s skyline Thursday night in a brilliant blue.